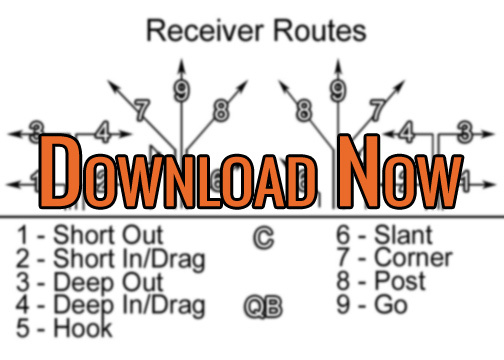 With this flag football defense, have 4 players line up across the field splitting the field evenly. Remaining player is the safety. The depth of the defense will depend on age level and skill of opponent. The 41 defense is a suitable defense across all age groups depending on your teams ability. At younger ages, I’ve found this defense along with the reverse 14 defense are the best to use. When facing teams that will predominately run, the 4 line should be about 3-5 yards off the line of scrimmage. This will give your players more to react to the play and help eliminate crossing the line on fakes. Using a “bend, don’t break” philosophy, I teach my kids to not move forward until the ball has crossed the line of scrimmage. They will only move side to side. As they move back and forth, they are not allowed to pass a fellow defender. This helps keep them from getting bunched up. In younger leagues, many touchdowns are scored when the running back reverses field after all the defenders have rushed to the ball. This is easier said than done especially the younger the kids are, however, with some practice and repetition, your team should be able to not break down most of the time. The safety follows the ball from side to side as well and is not allowed to cross the 4 line. 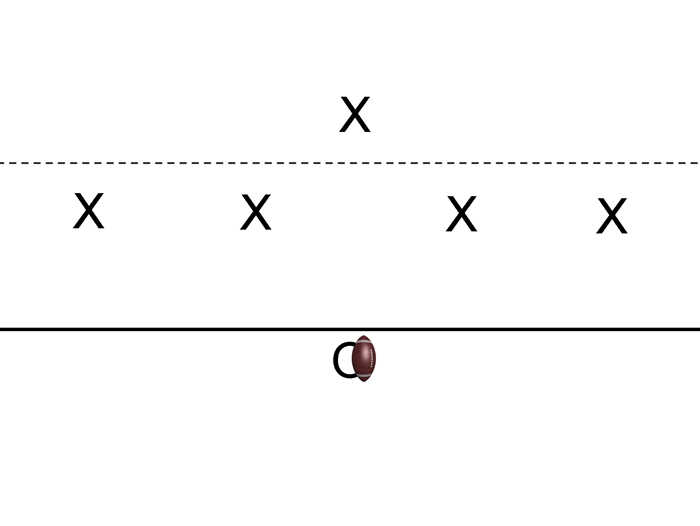 The goal is to funnel the runner into a situation where there are always three defenders in the area ready to pull the flag. This defense will break down if the two outside defenders (cornerbacks) allow the runner to have the sideline. In your drills and defense practice, you must emphasize cutting off the sideline and forcing the running back toward the middle. Using this defense against teams that have the ability to throw deeper down the field requires having a safety that is quick, fast, and disciplined as the weak points are up each sideline. If playing a teams that have a quarterback that can make accurate deep throws, you may have to lean toward a two safety defense instead. However, against teams that are lacking a consistent deep threat and rely on the nickle and dime approach, this defense should frustrate the offense. The 4 line should line up just beyond the rush line. This will give the offense some free yardage on short passes and quick runs, but this is OK if you adopt the “bend, don’t break” philosophy. I’m OK giving a team 5 yards every play and forcing them into a deeper 3rd down situation. Depending on your safety’s abilities, you can play the outside defenders two ways. You can have them either stay home and play their zone or stay with any receiver that tries to run up the sideline. I generally play it where the cornerbacks will play man to man if a receiver runs up the sideline. This will take some pressure of the safety, but will increase pressure on your linebackers (the 2 inside players on the 4 line). Many teams will try to run a receiver up the sideline and have another run an out or hook on the side where the other receiver went deep. If the linebacker does move over to play this receiver, the offense can get a nice chuck of yards. However, as with all defenses, there’s always some plays to attack it. The safety should follow the ball. If the quarterback rolls right, the safety should follow across the field. If the quarterback tries to throw deep to the opposite side, your safety should have time to cover the ground the defend the pass.